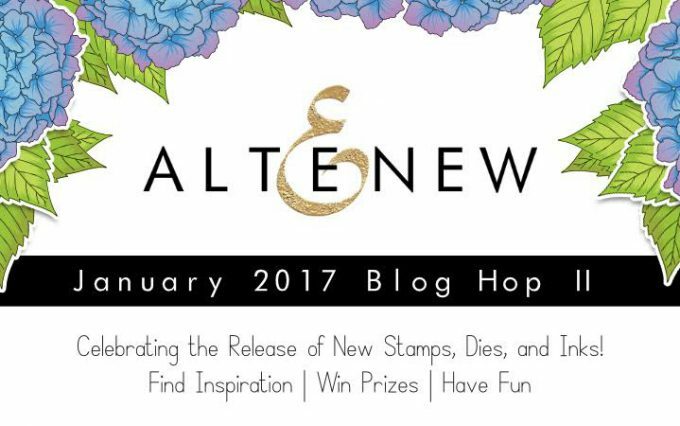 Hello there and thank you for stopping by to help celebrate Altenew January 2017 Release! 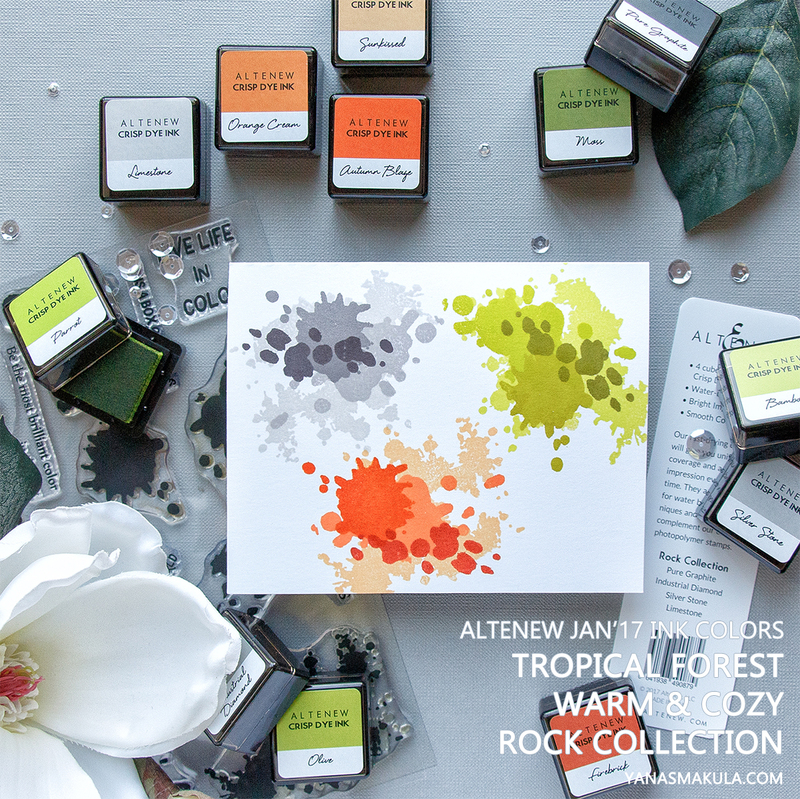 As always, there are lots of great products to pick from – new stamp sets, coordinating dies and new ink colors (scroll down to the bottom of this post to see all new colors in action)! 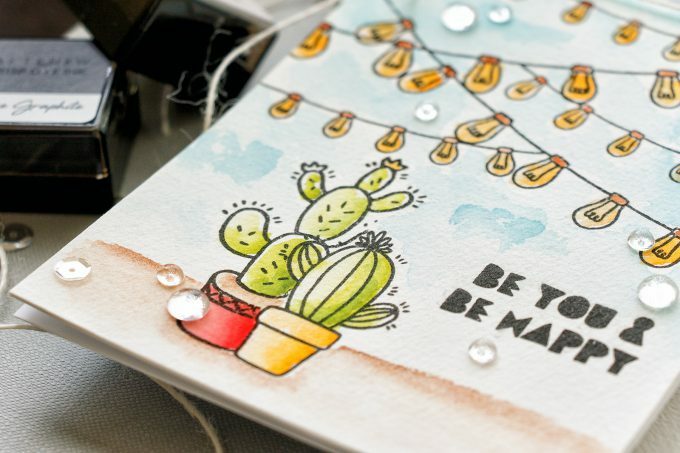 Now that I live in Phoenix and am constantly surrounded by cacti I couldn’t resist using the Be Strong set that features fun southwestern theme – they say Cacti are all the rage right now and I couldn’t agree more! I started working on my project by stamping the front cactus using Simon’s Intense Black ink on Arches Cold Press watercolor paper (it’s rather expensive paper but oh so very very good – you try it once and you never want to use another watercolor paper again). I used my MISTI stamping tool and triple stamped each image for the blackest black and most solid outline possible. Cold press paper always had some texture to it, so it’s hard to get a good impression when stamping using a clear block. I masked the front cactus and added another, slightly bigger one behind it. I also stamped Be You & Be Happy sentiment using same black ink and added a number of light strings to the top part of my watercolor panel. For my coloring I went with Daniel Smith watercolors (I am using their dot sampler chart – there’s a ton of color in each single dot; it’s meant for trying and testing colors but if you watercolor just a little bit this chart will last you a long time). I freehand colored the sky and horizon line as well as the sandy ground. 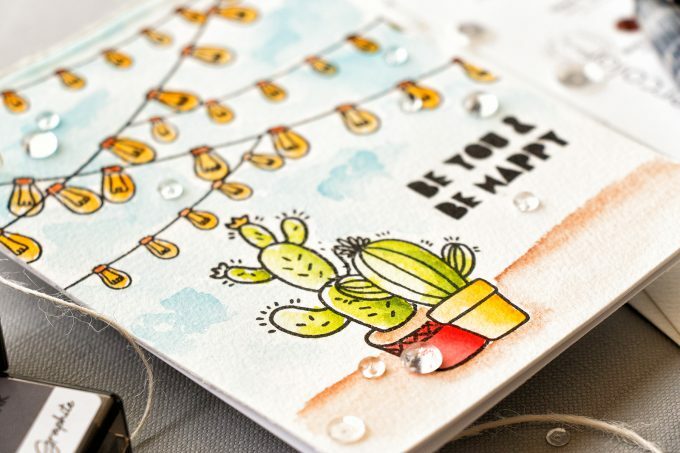 I added some natural twine from May Arts and also embellished my card using small and medium clear droplets from Pretty Pink Posh – I adore using them for my cards. 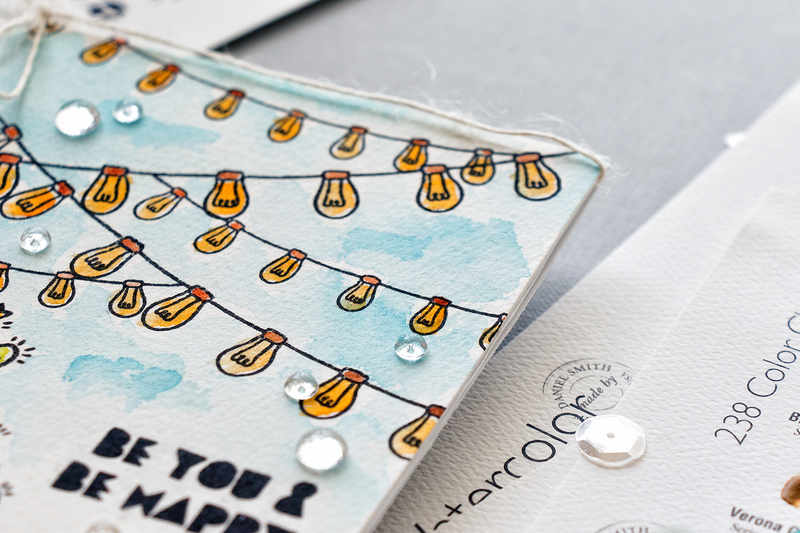 Here’s one last photo of this project where you can catch a bit of texture on the paper. I also used a Splash of Color stamp set together with one of the Sketchy Cities and added bold splashes of green to do some quick coloring. I love this set and I can see myself using it often to quickly color any image (and it’s going to be completely mess free!). I added a simple sentiment – Sometimes all you need is a little splash of color, tied some natural twine and adhered a strip of gold glitter tape and foam mounted my stamped panel onto card base made out of light gray cardstock. I thought it would be super fun to use the Splash of Color stamps to stamp all 12 new ink colors onto a piece of paper. I’m planning on stamping all Altenew inks like this for an easy visual representation. If you are a fan of Altenew Crisp Dye inks you’ll be happy to know they now have new colors available. A set of lush, tropical greens – Tropical Forest (this is a great addition to the 3 existing green colors); vibrant orange – Warm & Cozy and cool stylish gray colors – Rock Collection. All of these are available in individual pads and in large oval as well as small cube sets. To celebrate this release, Altenew is giving away a $50 gift certificate to THREE lucky winners! Please leave a comment on the Altenew blog by Thursday, February 2nd at 11:59 PM EST for a chance to win. The winners will be announced on the Altenew blog on Saturday, February 4th. I also have one $30 gift certificate to giveaway! Leave a comment below by the end of the day, Feb 2nd. I’ll pick a random winner on Feb 4th, post winner’s name in this post and will email the winner. The winner is Hey Jude Cards (Jude U). Congratulations! Thank you everyone for your lovely comments! The next stop on this hop is my good and crazy talented friend May Sukyong Park! You can also start over at Altenew blog. Yana you never disappoint. The cactus is my favorite. After living in Arizona for 20+ years I have a fondness for cacti. Thanks. Wow, these are so cherful and i love who you colored this. Yana , such a great job ! Amazing coloring and stamping as always!! The cactus stamp set makes me smile, as does your card. 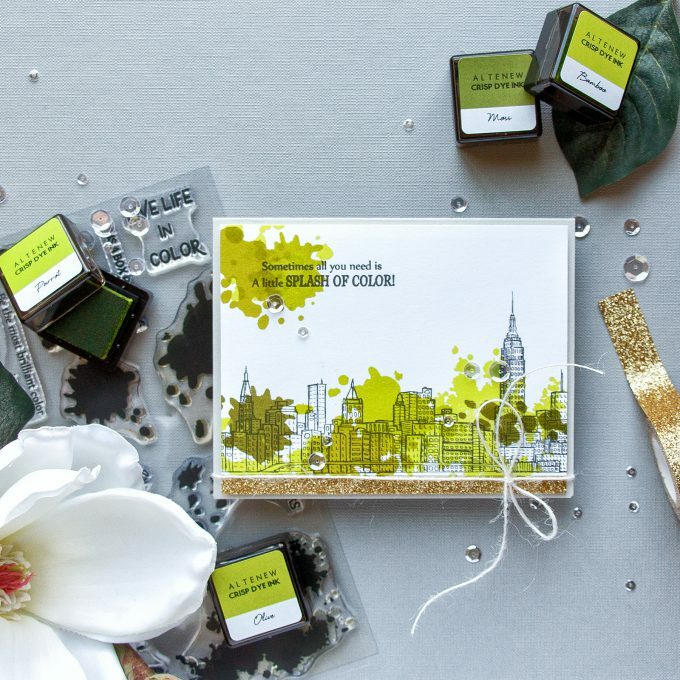 The splash of colors stamps will really be a help to those of us who are not so free. As always love your style. Thanks for sharing. Yana, I love your use of the splash of color. Such a great idea. Thanks for sharing. Love the cute cactus card, and how you’ve used Splash of Colour on the city card! These are adorable! 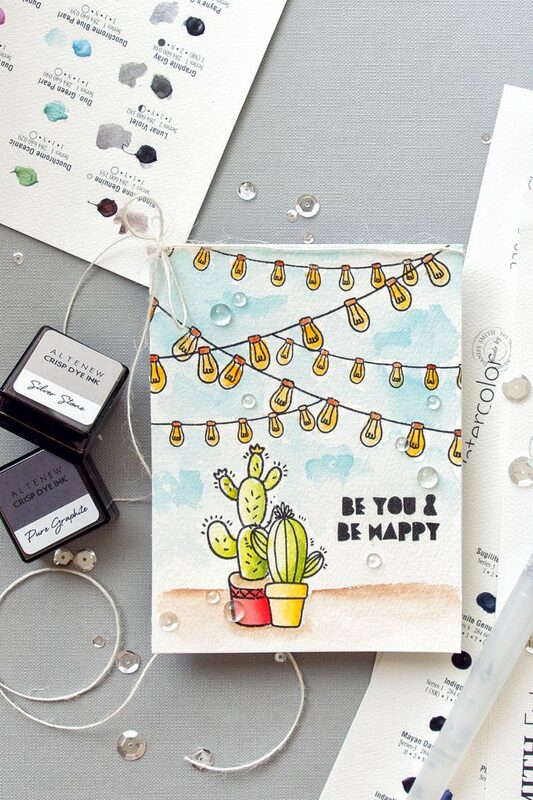 I’m loving the cactus card. 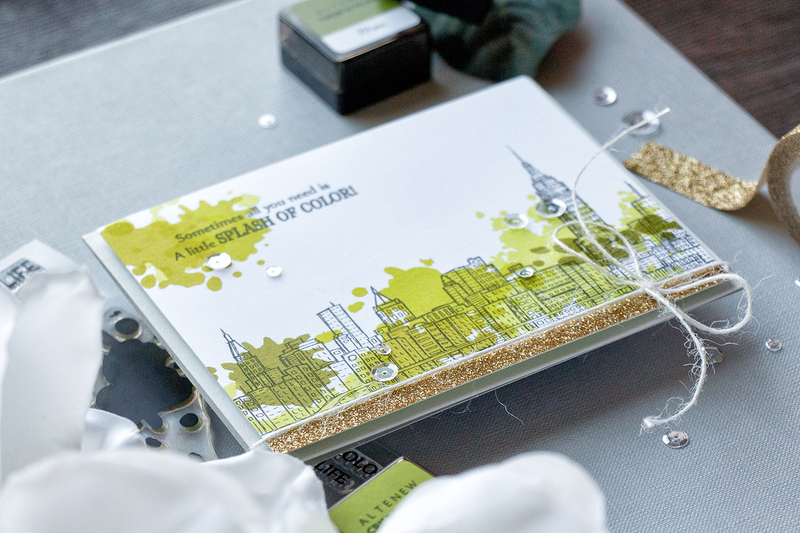 The city scape card looks so simple but so striking at the same time. 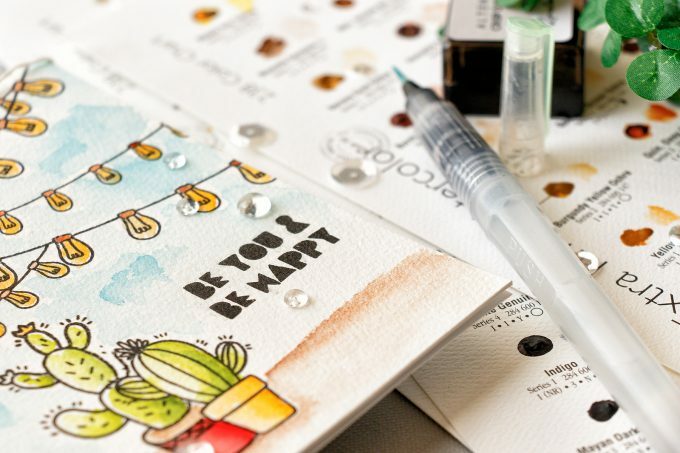 Your use of the Splash of Color stamp set gives me so much inspiration! I hope to be able to buy that set, I see it becoming a favorite! As always you have really great cards. Thanks for sharing. WooHoo! Lovin’ this release! Such awesome examples of techniques and inspiration! You rock! Beautiful cards! Love the layouts and the cactus card is so cute and fun. Great job! I absolutely adore your splash of color card. you are so creative. thank you so much for sharing your talent! love your cards. the colors in the cactus picture are perfect! I love the lights. They bring so much character to the card. 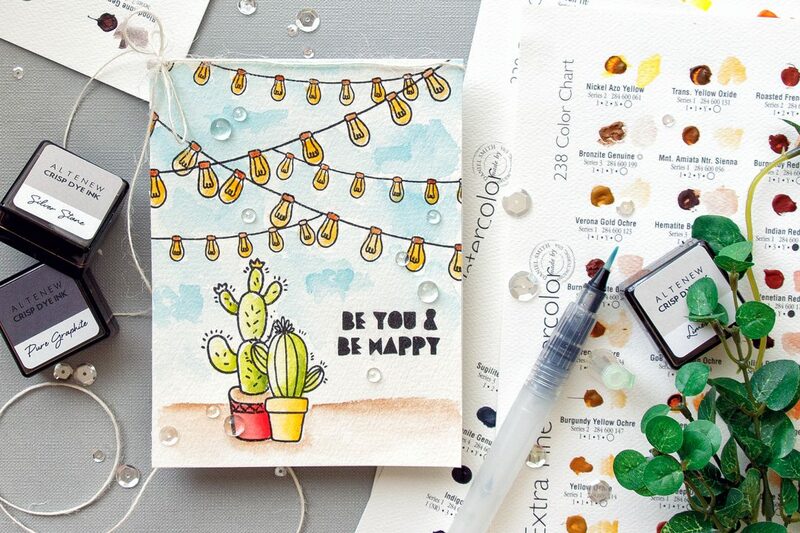 Your cactus card is so cute!! I also really like the layering you did with the splat stamps and the colors. So cute! I love how you used the new green inks! Love that cactus set, it is so much fun!! 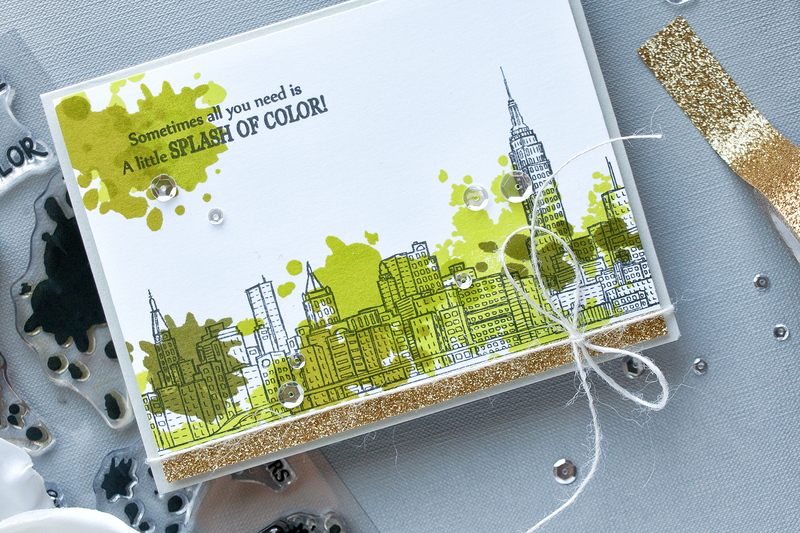 Love the splash of color stamp set so fun! Thanks for the chance to win! Very very nice you never disappoint Us! Thank you for sharing! Love these cards! 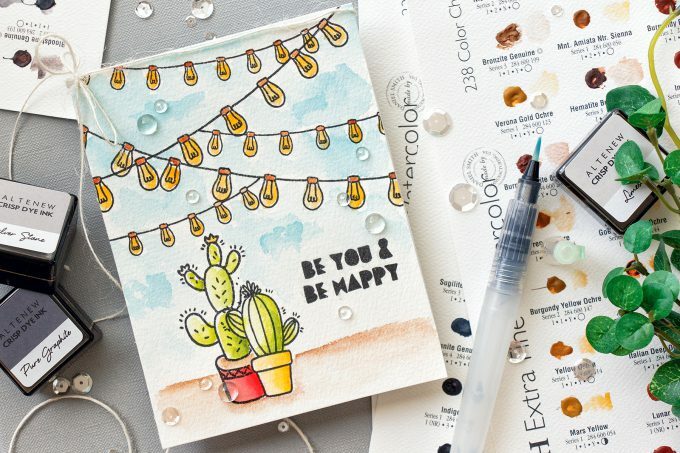 My parents are in AZ for half of the year, so I can think of all different ways to use that cacti stamp set! Gorgeous cards! Very colourful! Thanks for sharing. Great cards! Now I have a use for the splotch stamps, Love how you used it for background!